Speculative Romance Author Regina Paul: Author Spotlight: Dangerous Magic by 404 ~ Page Not Found! Please welcome Jessica Lauryn today to my blog! 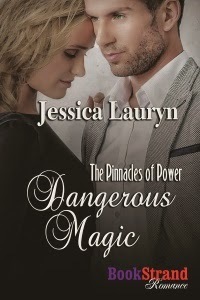 And guess what, in addition to getting a chance to check out a really cool story, Jessica tells me that Dangerous Magic, as well as the first two books in the Pinnacles of Power Series, Dangerous Secret, and Dangerous Proposal (Dangerous Magic is book 3) are all .99 for a limited time on Amazon! Just go to the link below to get the first three books in this series! Corinne rubbed her arms as she stood, realizing that the temperature had dropped significantly. The wind had kicked up and it was rustling swiftly through the trees. All of them swayed in the same direction, their long pine branches blowing toward the river, the mountain above it, and valley below. The powerful gust seemed to whisper something over the sound of the rushing water below it.Corinne. Assuring herself that the wind didn’t talk, Corinne buttoned her jacket and slipped her hands inside of her pockets. Moving along the dirt path, she’d only walked a few steps when she heard the sound again. Someone was chanting. And they were calling her name. Corinne. Corinne’s heart thumped in her chest. Someone was there watching her, only she couldn’t see them. As she turned in the direction of the trees, she felt a warm sensation spread along her arms and legs. It seemed to urge her in the direction that the sound was coming from—the woods on the other side of the river. Filled with an overwhelming desire to follow the sound, Corinne turned toward the river. The body of water was shallow, full of large rocks which made it difficult, yet not impossible, to cross to the other side. Lifting one leg, she placed the sole of her shoe against the wet stone beneath it. Keeping her arms out to the sides to maintain her balance, she stepped from one rock to the other, moving stealthily over the rush of the water, bending to place her hands against the final large rock for support. She stepped onto the ground, finding that she was encased in a maze of thin trees which lined the riverbank. She was on a hill, which began to level off the lower it went. Looking down toward what appeared to be the base of the mountain, Corinne was overpowered by the desire to move deeper into the forest. Travelling on without hesitation, Corinne allowed her instincts as well as the newly reappeared moon to guide her. Never before had she done anything so reckless. But this strong inner feeling told her that she was safe, that her children were safe, and that she needed to stop hesitating and keep moving. Corinne wandered through grass, dirt and rocks, unafraid of what sorts of wild animals might be lurking about or how deep into the woods she’d gone. The forest was one gigantic maze of trees and they were difficult to navigate through when all of them looked the same. She wasn’t entirely sure of how to go back the way she’d come. Yet her legs walked on. Sometime later when her feet were about to give out she noticed a streak of orange light shining through the trees. There was a clearing ahead, and in its center was a fire. A person was standing several feet away from her, facing the fire. Corinne kept her eyes on the back of the person’s head, coming to realize as she moved across the small, open field that he or she was wearing a black cloak, and that a hood covered his or her head. The person appeared to be as tall as the trees surrounding them, and seemed to emanate as much heat as the fire itself. She crept closer until she and the figure were standing only a few feet apart. Corinne’s hand lifted itself into the air, and, as if by magic, it touched down against the shoulder before her. The figure turned around, his striking green eyes locking with hers as a smile that could only be described as wicked formed on his face. He tossed back his hood, closing the distance between them, snatching her wrist. “Jack!” Corinne’s heart pounded. She intended to throw a hand over her mouth, but one of her hands was trapped and the other one tingled uncontrollably, remaining at her side. Seven years to be exact. But standing beside Jack Madera, her once coworker and friend, Corinne felt as though she’d stepped back in time and into a dream. Come to think of it, all of it felt like a dream, particularly since she didn’t seem to be in control of her movements. But if she was dreaming, why did the fire’s flames feel so hot? And why was her pulse racing like the ticking of a clock? Jack, whose face was sprinkled with dark facial hair that was only slightly thinner than the hair on his head, bore down on her. He smelled of incense and musk, a sweet and alluring mixture which, combined with the scent of the woods around them, was distinctly male. So lost in a mix of confusion and desire, Corinne didn’t even realize that this large fingers had closed over hers. Jack squeezed her hand and his smile widened as he lifted it, bringing it against his mouth. He kissed her palm, sending a powerful rush of need along her skin. Corinne swallowed as she attempted to slip her hand free. But she was powerless to remove it, and it remained encased in Jack’s. Corinne gasped as Jack shortened the distance between them, trying without success to keep a respectable amount of personal space. She became aware of his body as it pressed against hers, and of his heat, which was hotter than the fire itself. She had always known that Jack was a witch—anyone could have gotten that simply by virtue of the pentagram he wore around his neck. But she’d never realized that he was capable of doing…whatever this was, until now. An author of Contemporary Romantic Suspense, Jessica Lauryn is most intrigued by dark heroes, who have many demons to conquer...but little trouble enticing female companions into their beds! She feels that the best romances are those where the hero is already seducing the heroine from that first point of contact. In Jessica's debut series, The Pinnacles of Power, five troubled bad boys: Ryan, Alec, Colin, Lucas and Jack must let go of the mistakes of their pasts as they battle the dangers surrounding an underground organization called Project Gemstone. Each man crosses paths with a strong, feisty heroine who has the ability to capture his heart and change the course of his life forever. Ryan's story, Dangerous Secret, kicks off the series in the picturesque town of North Conway, New Hampshire. 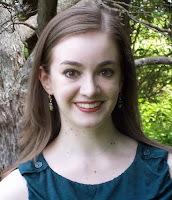 Jessica is a proud member of both Romance Writers of America and her local chapter, New Jersey Romance Writers. When she's not writing, she enjoys listening to as much 80's music as possible, keeping current with the story lines on Days of Our Lives and The Young and the Restless, shopping for the latest fashions and the prettiest of antiques, and taking long walks in nature where she can daydream about anything romantic. Though she resides in New Jersey, her heart belongs to the White Mountain National Forest in New Hampshire.